Bust of Louis-Alexandre de Bourbon, comte de Toulouse, by Yves-Étienne Collet (1761-1843). On display at Brest naval museum. The Count of Toulouse was the ruler of Toulouse during the 8th to 13th centuries. 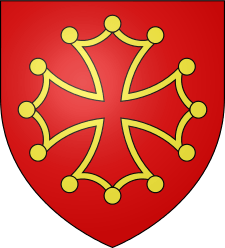 Originating as vassals of the Frankish kings, the hereditary counts ruled the city of Toulouse and its surrounding county from the late 9th century until 1270. The counts and other family members were also at various times counts of Quercy, Rouergue, Albi, and Nîmes, and sometimes margraves (military defenders of the Holy Roman Empire) of Septimania and Provence. Count Raymond IV founded the Crusader state of Tripoli, and his descendants were also counts there. 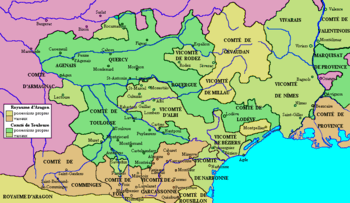 They reached the zenith of their power during the 11th and 12th centuries, but after the Albigensian Crusade the county fell to the kingdom of France, nominally in 1229 and de facto in 1271. During the youth of young Louis, his tutor, Torson (sometimes Chorso or Choson), ruled at Toulouse as the first count. In 788, Count Torson was captured by the Basques under Adalric, who made him swear an oath of allegiance to the Duke of Gascony, Lupus II. Upon his release, Charlemagne, at the Council of Worms (790), replaced him with his Frankish cousin, William of Gellone. William in turn successfully subdued the Gascons. In the ninth century, Toulouse suffered in common with the rest of western Europe. It was besieged by Charles the Bald in 844, and taken four years later by the Normans, who had sailed up the Garonne. About 852, Raymond I, count of Quercy, succeeded his brother Fredelo as Count of Rouergue and Toulouse. It is from Raymond that all the later counts of Toulouse document their descent. His grandchildren divided their parents' estates; of these Raymond II became count of Toulouse, and Ermengol, count of Rouergue; while the hereditary titles of Septimania, Quercy and Albi were shared between them. Raymond II's grandson, William III (known as the first William Taillefer), married Emma of Provence, and handed down part of that lordship to his younger son Bertrand I of Forcalquier. William's elder son, Pons, left two children, one of whom, William IV succeeded his father in Toulouse, Albi and Quercy; while the younger, Raymond IV, ruled the vast possessions of the counts of Rouergue. From this time on, the counts of Toulouse were powerful lords in southern France. Raymond IV, assumed the formal titles of Marquis of Provence, Duke of Narbonne and Count of Toulouse. Afterward, the count set sail with the First Crusade. After the conquest of Jerusalem, he set siege to the City of Tripoli in the Levant. Raymond died before the city was taken in 1109, but is considered the first Count of Tripoli. His son, Bertrand, then took the title. He and his successors ruled the Crusader state until 1187 (when the Kingdom of Jerusalem was overrun by Saladin). While Raymond was away in the Holy Land, rule of Toulouse was seized by William IX, Duke of Aquitaine, who claimed the city by right of his wife, Philippa, the daughter of William IV; William was unable to hold it long. Raymond's son and successor, Bertrand, had followed him to the Holy Land in 1109. Therefore, at Raymond's death the family's great estates and Toulouse went to Bertrand's brother, Alfonso Jordan. His rule, however, was disturbed by the ambition of William IX and his granddaughter, Eleanor of Aquitaine, who urged her husband Louis VII of France to support her claims to Toulouse by war. Upon her divorce from Louis and her subsequent marriage to Henry II of England, Eleanor pressed her claims through Henry, who at last, in 1173, forced Raymond V to do him homage for Toulouse. Raymond V, a patron of the troubadours, died in 1194, and was succeeded by his son, Raymond VI. Following the 1208 assassination of the Papal legate, Pierre de Castelnau, Raymond was excommunicated and the County of Toulouse was placed under interdict by Pope Innocent III. Raymond was eager to appease the Pope, and was pardoned. However, following a second excommunication, Raymond's holdings in the Languedoc were desolated by the Albigensian Crusade, led by Simon de Montfort. Raymond's forces were defeated in 1213, depriving him of his fees, and he was exiled to England. Montfort finally occupied Toulouse in 1215. Raymond VII succeeded his father in 1222. 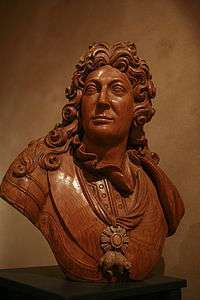 He left an only daughter, Joan, who married Alphonse, the son of Louis VIII of France and brother of Louis IX of France. At the deaths of Alfonse and Joan in 1271, the vast holdings of the counts of Toulouse lapsed to the Crown. In 1271,Toulouse passed to the Crown of France, by the Treaty of Meaux, 1229. From 1271–1285, Philip III of France, King of France and nephew of Alphonse bore the title of count of Toulouse, but the mention of the title is abandoned after his death. Note: It had long been thought that Raymond III Pons was succeeded directly by William III. However, recent research suggests there were at least one, and as many as three, previously overlooked counts; and that at least one of these three was named Raymond. This has resulted in conflicting numbering systems regarding the later Raymonds, although most historians continue to use the established, traditional numbering for them. 1094–1105 Raymond IV (VI) of St Gilles, inherit the County as Philippa, the daughter of William IV, was barred from inheriting it by Pons's will. 1271 Philippa de Lomagne (great-granddaughter of Constance of Toulouse, daughter of Raymond VI) tries unsuccessfully to claim the inheritance of the county. Note: Counts not issued from the House of Rouergue aren't bolded above. ↑ L. Ariste and L. Brand, Histoire populaire de Toulouse depuis les origines jusqu'à ce jour (Toulouse, 1898). ↑ "The Counts of Toulouse (Coms de Toloza)". Midi-france.info. Retrieved 2012-11-05. ↑ Note:About 975 there had been a partition of the estates which the second William Taillefer and his cousin, Raymond II of Auvergne, held in common. Albi and Quercy, went to William; Gothia, to Raymond. 1 2 "Flanders, Brittany, Burgundy, Anjou, Normandy, Blois, Champagne, Toulouse, etc". Friesian.com. Retrieved 2012-10-17. ↑ Family Tree in Roglo.eu [retrieved 3 September 2014].